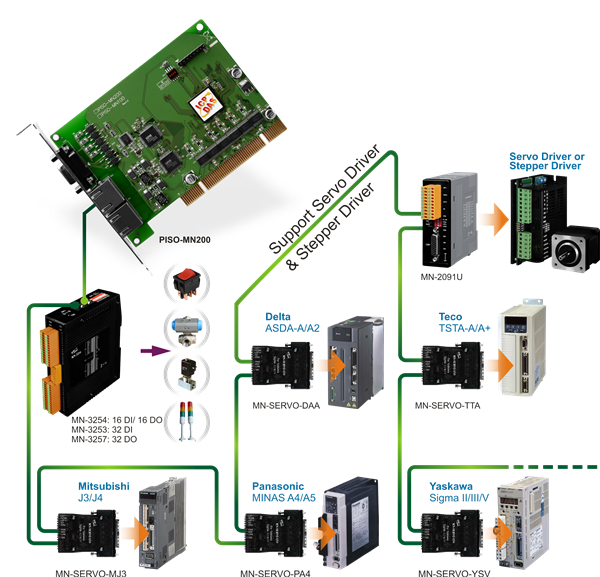 Motionnet comprises of a high-speed serial communication system that involves Master card and Slave modules. ICP DAS USA has two categories of Slave devices: Digital I/O, and Motion Control. Users' actuators/sensors can be easily connected with our Motionnet devices. Motion control modules work together with either a Servo or Stepping motor. Motionnet communication between a Master and the Slaves devices is based on RS-485 technology (Multi-drop, Half-duplex). This technology provides the advantage of simplifying connectivity of devices between remote distances while still offering high speed. Data transfer for the I/O modules is cyclical and time deterministic, so this mean that Motionnet devices can be used for other numerous industrial automation applications.